The Florida Keys is one of America’s most iconic road trips. Starting in Miami and extending south until Key West, this 113-mile stretch of road takes only three hours to complete. But to drive end-to-end with no breaks would be doing yourself a disservice.That’s because this island chain is beautifully diverse and feels a world apart from the theme parks and shopping malls of mainland Florida. While it is Key West that typically gets all the attention, anyone who has taken the time to stop at all the islands will tell you that they each offer a unique experience. Before you start your journey, ensure you have a read through our top 10 must do’s in the Florida Keys and make a point of stopping at least once on each island. 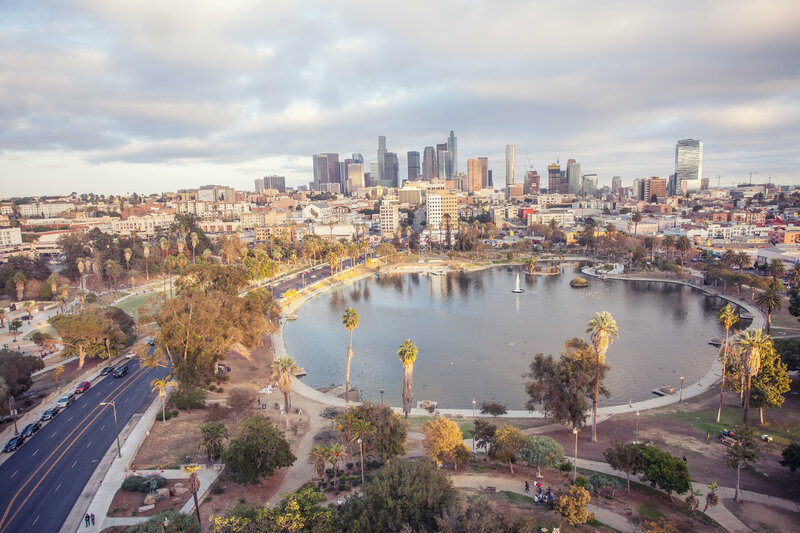 Los Angeles is a popular city for a weekend break – whether it’s a stopover on the way to the Pacific Ocean or Asia, or as part of wider Western America road trip. Thing is though, it’s a big city and it can feel like a mammoth task planning how to see as much of it as possible in two days. So we’ve done it for you. Including where to stop for lunch and dinner, and how to get around the city. 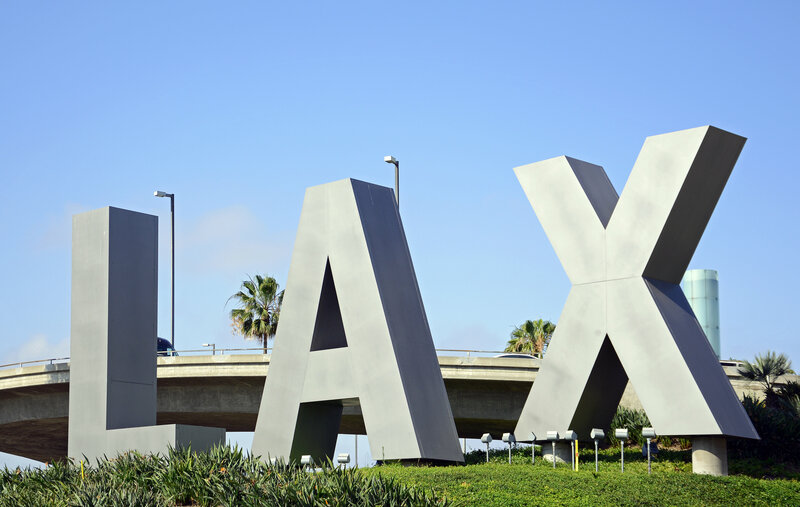 Los Angeles International Airport, or LAX, is located southeast of the city, about 15 miles from downtown and 20 miles from the San Fernando Valley. There’s an Airport Bus that connects the airport to three stops in LA: Van Nuys, located in the Valley; Westwood, about halfway between Santa Monica and Beverly Hills; and Union Station in downtown LA. These buses usually don’t cost more than $10 per person, but they only take debit and credit cards. Alternatively you can get a cab at the airport, which will cost more but can drop you at your hotel door step (and ready to start your 48 hours!). Time to rise and shine and beat the queues, because we’re heading north to Universal Studios Hollywood™. 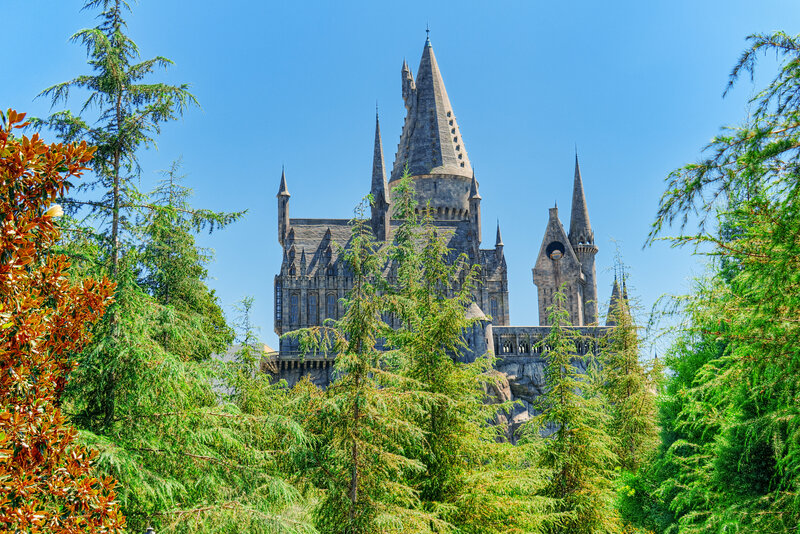 There’s a full day of adventure to be had here, including The Wizarding World of Harry Potter™, King Kong 360 3D, Springfield U.S.A, The Walking Dead Attraction, and (of course) the world-famous Studio Tour. When it’s time for lunch you’ll be spoilt for choice with real-life replicas of fictional places – such as Three Broomsticks™, Moe’s Tavern, and Jurassic Café. You can also head into City Walk, where you’ll find restaurants, cinemas and souvenir shops. Transport links: the Los Angeles Metro can drop you right outside Universal Studios Hollywood™ if you take the Red Line and get off at the Universal City/Studio City station. It might take you a full day to get around Universal Studios Hollywood™ but if you do make it out within the afternoon, head over to Warner Bros. Studio Tour Hollywood (which is less than a ten-minute drive away). 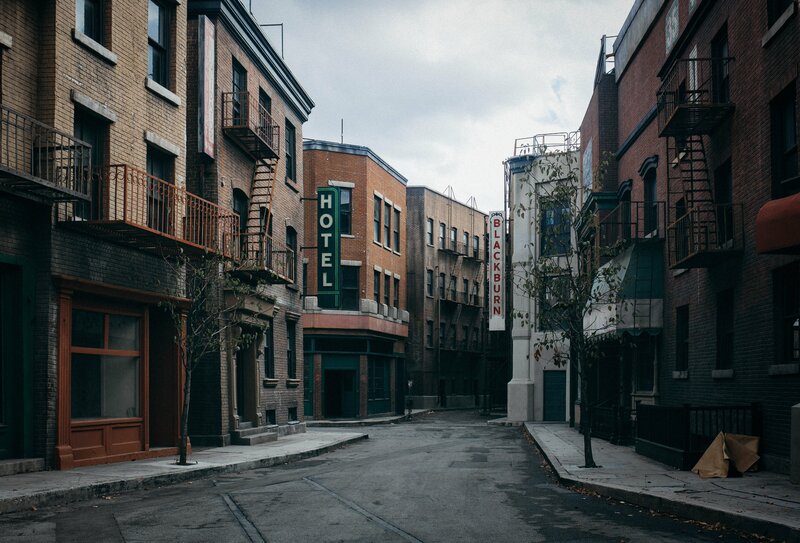 On the tour, you’ll come across outdoor sets and soundstages used to create productions such as The Big Bang Theory, Pretty Little Liars, La La Land, Argo, and Gilmore Girls. Studio Tour guests will also stop at the DC Universe – DC Comics Exhibit, the real Central Perk Friends set, and the original Batman Museum – Batmobile Collection. Side note: working your way through both Universal Studios Hollywood™ and Warner Bros. Studio Tour Hollywood will be tight, but it’s not impossible if you book tickets in advance and plan which attractions you want to see. Before you head back into Central LA stop by the Griffith Observatory, which is open until 10pm. This art deco landmark from 1935 features a high-tech planetarium, public telescopes and some of the best views of Los Angeles (including the famous Hollywood sign). Transport link: hailing a cab is your best way to get from Warner Bros. 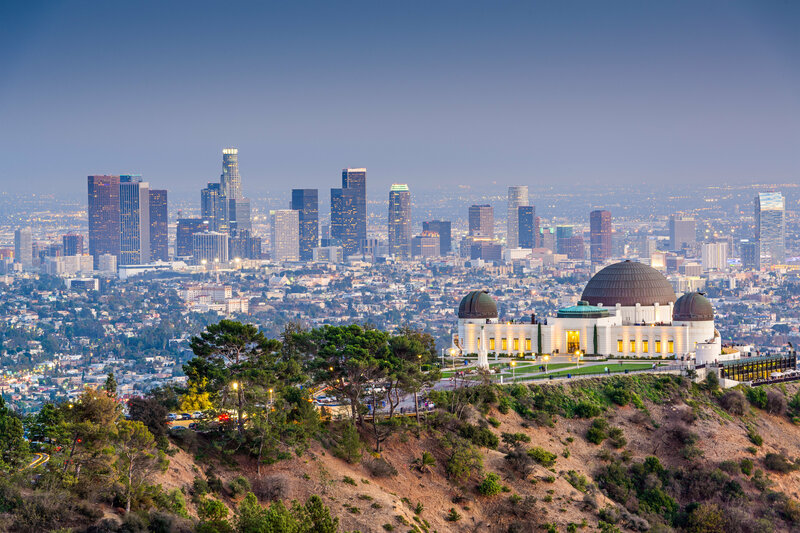 Studio Tour Hollywood to the Griffith Observatory, though you can take a scenic 2-hour walk through Griffith Park. When you’re finished, The Griffith Observatory is an hour’s walk from Sunset Boulevard and there is a bus between the Observatory and the Vermont/Sunset Metro Red Line Metro Station. Los Angeles is celebrated for its nightlife, and there are plenty of places to choose from. Though the Downtown Arts District in the east of the city is definitely LA’s neighbourhood of the moment. It’s an industrial district turned chic nightlife epicentre, and home to delicious restaurants like Bestia, the inspiring Hauser & Wirth Gallery, and a bevy of breweries. In the wider Downtown District, you’ll also find several nightclubs to party away in until the early hours. Saturday’s itinerary was quite adventurous, but don’t worry because Sunday is more relaxed. 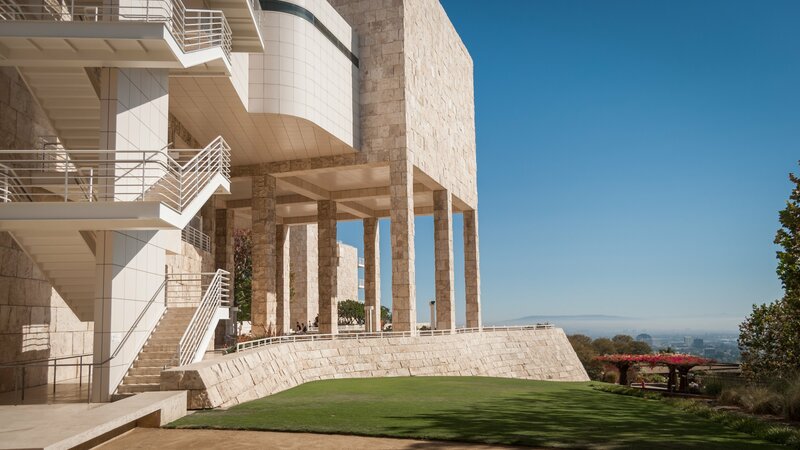 Head out to The J. Paul Getty Museum in Bel Air, one of the world’s largest arts organisations. Its collection includes Greek, Roman, and Etruscan art from the Neolithic to Late Antiquity. As well as European art—including illuminated manuscripts, paintings, drawings, sculpture, and decorative arts—from the Middle Ages to the early twentieth century. Take a slow wander around the decorated halls to wake yourself up. Transport links: this is up a hill with not much else around it, so we recommend booking a taxi, Lyft, or Uber. Make your way back into the city, firstly stopping off in Beverly Hills. Even if this area is out of your price range, it’s still well-worth a visit to admire the lavish boutiques, take a picture with the iconic Beverley Hills sign, stop by the Sprinkles Cupcake ATM, and book a tour of the most extravagant houses in LA. There are also a lot of restaurants in Beverley Hills to choose from, including Mastro’s Steakhouse, The Cheesecake Factory, and Ocean Prime. Afterwards, head up to Hollywood Boulevard and find your favourite stars on the Hollywood Walk of Fame. 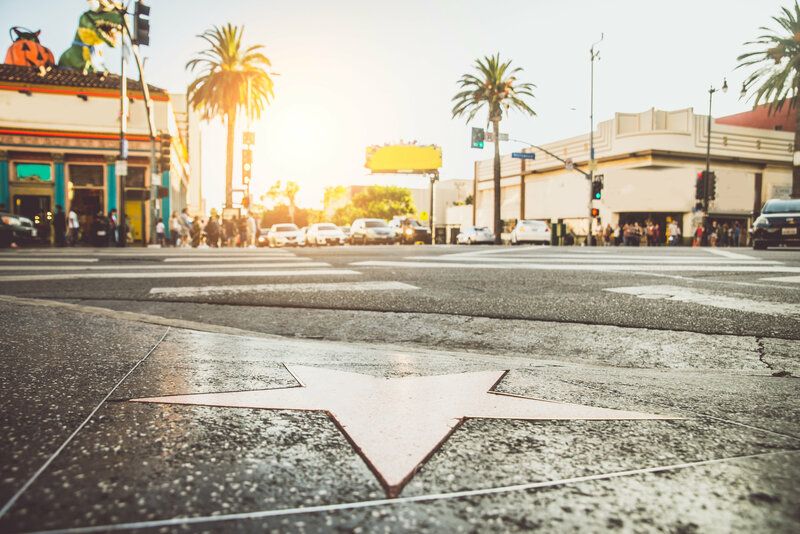 Then explore some of the nearby landmarks such as the Hollywood Wax Museum®, Museum of Death, and the Capitol Records Building. Transport links: there are no direct buses or metro line between the Getty Museum and Beverley Hills and Hollywood so we recommend getting a taxi, Lyft, or an Uber (which will take little over 10 minutes). While you’re in the Hollywood area of Los Angeles, you have to catch a show. This is the home of showbiz after all! Along Sunset Boulevard you’ll find several famous venues – from the Laugh Factory for comedy, The Roxy Theatre for rock music, ArcLight for showing first-run movies, Upright Citizens Brigade Theatre where many well-known actors and comedians started their careers, and Hollywood Palladium for the big name performers. Have you been to Los Angeles? What attractions would you recommend to someone only in the city for 48 hours? Illinois is famous for a few things – but one of the most notable is the starting point of the famous Route 66. Three hundred miles of this iconic road stretches through the state of Illinois and passes by some incredible attractions and sights along the way. If you’re embarking on your first Route 66 adventure, here are a few of the places we recommend you stop at. The famous Route 66 starts right in the heart of Chicago, and you’ll find the iconic Route 66 Begin sign on East Adams St./Jackson Blvd. & South Michigan Av. Route 66 is home to numerous great museums – but if you can only visit one, we recommend the Hall of Fame. Among the artefacts, you’ll find the bus and van of Route 66 icon, Bob Waldmire: an artist famous for his whimsical maps of the Mother Road and its human and natural ecology. Remember to get a photo with the World’s Largest Route 66 mural in Pontiac. In Wilmington, Atlanta, and Springfield, you’ll notice each town is home to a giant and colourful statue (they’re not hard to spot). They were all once used for promotional purposes by local businesses, but are now iconic in their own right. Tall Paul is located alongside Route 66 in Atlanta and cannot be missed as you drive past. The Gemini Giant stands alongside the Launching Pad Drive-In in Wilmington. While the Lauterbach Tire Man is found outside Lauterbach Tires on Wabash Avenue in Springfield. The city of Springfield was the home of Abraham Lincoln for the 17 years leading up to his election as the 16th president of the United States. There are a few Lincoln themed attractions in Springfield, but the best is undoubtedly the Lincoln Presidential Library and Museum. It’s home to the world’s largest collection of Lincoln-related documents, including realistic holographic presentations, a show reel of the 1860 presidential election, plus clothes and toys of that era. Step back in time to Old Route 66 at its best. A short drive outside of Springfield, you’ll find Brick 66: a beautiful 2.5-kilometer-long stretch of restored, hand-laid brick road from 1931 that is beautifully framed by rolling hills. Welcome to the home of the all-American corn dog. Established back in the 1940s, Cosy Dog Drive-In is not just a restaurant but also a souvenir shop and mini-museum with an impressive collection of Route 66 memorabilia. For something a bit out-of-the-ordinary, head to Henry’s Rabbit Ranch Home – where you’ll find rabbits of both the hopping kind and the VW kind. You’ll also stumble upon a giant fiberglass jackrabbit that visitors can climb onto the back of, and a bunny graveyard paying tribute to some of the ranch’s previous residents (plus a gift shop with Route 66 souvenirs). The Pink Elephant Antique Mall features a number of unique roadside attractions and multiple photo opportunities! The mall itself sports larger than life sculptures including a pink elephant and a large male statue from the move ‘Flatliners’. In addition to a retro-looking ice cream shop, the newest edition is the Mother Road Fudge-n-Candy shop. Enjoy retro candy, chocolates and homemade fudge! The World’s Largest Catsup Bottle stands proudly next to Route 159, just south of downtown Collinsville, Illinois. This unique 170ft tall water tower was built in 1949 by the W.E. Caldwell Company for the G.S. Suppiger Catsup bottling plant – bottlers of Brooks old original rich tangy Catsup. As you leave Illinois, remember to snap a selfie at the Old Chain of Rocks Bridge out of Collinsville. Built in 1927, it’s the fifth bridge to cross the Mississippi River – and was part of the original Route 66 road – the perfect way to wave goodbye to Illinois as you carry on your Route 66 adventure. People tend to fall in love with Chicago very quickly – and it’s not hard to understand why. The city has plenty to do: including sports, shopping, fun fairs, museums and even a beach! But there’s a vibe about Chicago that you can’t mistake. It’s buzzing, but it’s also friendlier than your average large metropolitan. We recommend that every city-lover stops by Chicago at one point in their life – and here’s our guide to making the most of any visit. Chicago’s vast size can be daunting for first-time visitors with so many attractions to pick from. While we’d encourage you to research everything Chicago has to offer and decide what’s right for you, we’ve pulled together a selection of Chicago’s best sights. 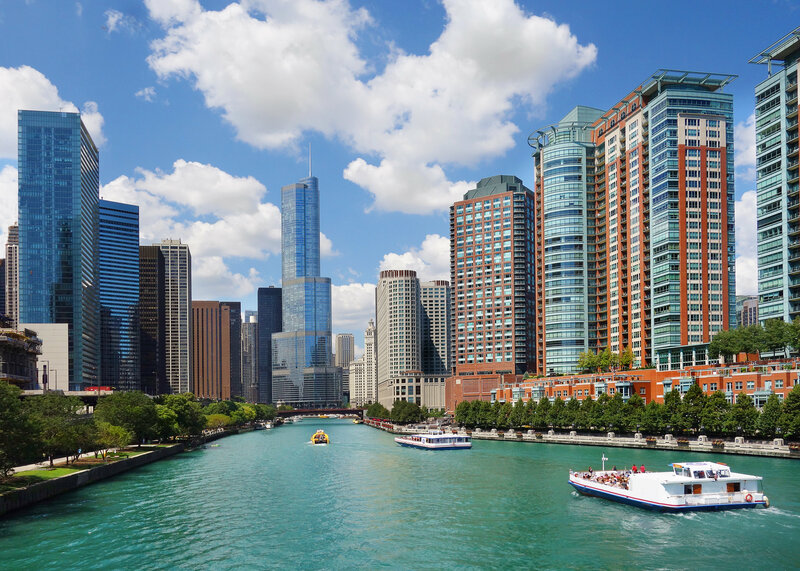 One of the most relaxing ways to take in the beautiful sights of Chicago is on a boat tour along its river and lake. Choose between Chicago’s First Lady and Shoreline Sightseeing, or get adventurous with Kayak Chicago. You’ve probably seen the pictures of a bean-like structure in Chicago? You’ll find it here in Millennium Park. Amongst the 25-acres of public space, you’ll find FREE art installations, outdoor concerts, film screenings, outdoor workouts, and tours. In winter there’s also an outdoor ice-rink. Chicago is home to a very eclectic and stylish shopping scene, with the Magnificent Mile as its epicentre. 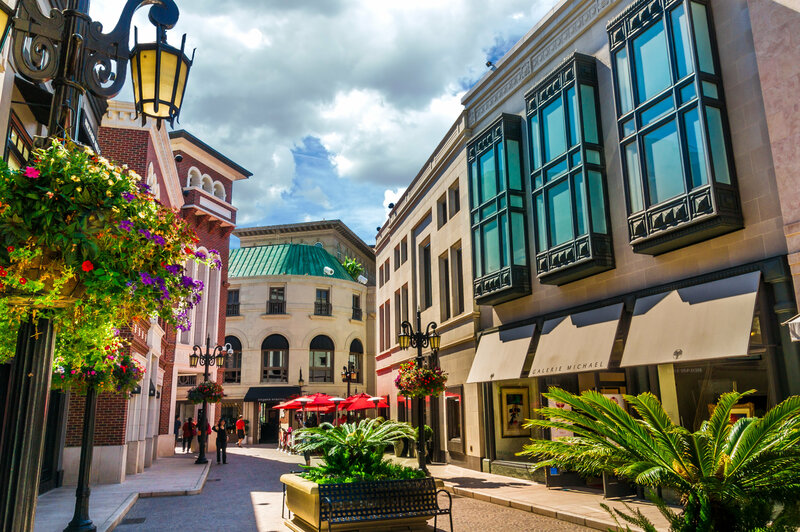 This cosmopolitan, history-packed strip on downtown Michigan Avenue (between the Michigan Avenue Bridge and Oak Street) is home to department stores, multi-story megamalls, luxury boutiques and brand name retail chains. The world-renowned Art Institute of Chicago hosts one of the biggest collections of late-19th-century French art in the world. While the Museum of Science & Industry is the largest science museum in the Western Hemisphere. Oh, and The Field Museum is home to Titanosaur, the largest dinosaur to roam the Earth. You could spend a week just exploring the museums and art galleries. There’s museums that document and celebrate African-American heritage, Jewish tradition, Mexican art, Lithuanian culture, Ukrainian history, Puerto Rican culture, military history, maritime history, and even an American Writer’s Museum. Chicago loves its sports, particularly soccer, baseball, football, basketball, and hockey. There’s always a game happening in Chicago so it’s worth searching for one while you’re in town. Chicago is famous for its deep-dish pizza, and while there is more to the city’s food scene than this – you will still find a lot of pizzerias. Lou Malnati in the River North area is generally regarded as the best place to stop by for a slice of this famous dish. Other foods that are quintessentially Chicago include their own style of hot dog (it’s topped with vegetables), Italian beef (a style rarely found outside the city), and steak (Chicago is the meat-packing capital of the world). For something a little different, you can visit the old haunts of Al Capone, such as the Green Mill Cocktail Lounge or the Green Door Tavern. Chicago was once awarded “City of the Year” by GayCities.com, and its gay district Boystown was named “best gay neighbourhood in the world” by Out Traveler magazine. It’s no wonder though as Chicago boasts a rich and proud LGBTQ history, which you can learn all about with an LGBTQ+ Landmarks Tour, or by strolling the Legacy Walk in Boystown. There’s also a selection of LGBTQ+ businesses, ranging from bookstores to nightclubs. Chicago is the home of United Airlines, so there’s no shortage of flights. There are several flights to Chicago a week from the UK, including a new service from Edinburgh to O’Hare International Airport. O’Hare International Airport is home to an on-site hotel, a yoga room, mother’s room, and an aeroponic garden. Once you’re in Chicago, The El (short for the CTA’s elevated train, which also includes subway trains) offers a quick and inexpensive public transportation option. If you need to get out to the suburbs, Metra Trains from Union, Ogilvie, and La Salle Street stations provide several convenient routes. If you’re not going very far and just want to explore the city centre, it’s easy enough to hail a cab. Lyft and Uber also have a presence within the city. If you’re a keen cyclist, you can also make use of the city’s bike-share service, Divvy. Their bike rental stations can be found across the city, where you can pick up one of their unmistakable blue bicycles. If you’re walking, Chicago’s streets are laid out in a handy grid system. The perfect family destination is somewhere that expertly combines excitement and relaxation. In Tampa Bay on Florida’s Gulf Coast, you’ll stumble upon a pleasant mixture of both. Whether it’s roller coasters, museums, or nature – families will discover plenty of attractions where they can create memories that will last a lifetime. Busch Gardens® Tampa Bay offers the perfect blend of theme park and animal adventures. Within its 300 acres, you’ll find thrilling rides, one of the country’s premier zoos with more than 12,000 animals, live shows, restaurants, shops and games. Admissions: Adult tickets are $84.99, while children aged 3-9 get in for $76.99 (children 2 and under are admitted for free). Just across the street from Busch Gardens® Tampa Bay you’ll find Adventure Island® waterpark. It’s perfect for all the family with thrill-seeking water-rides like Colossal Curl™ (the tallest ride at Adventure Island® at nearly 70 feet and 560 feet in length) and private cabanas where quieter members of the family are able to relax with a book. Admissions: Adult ticket prices are $44.89 plus tax, and children ages 3 to 9 are $40.61 (children ages 2 and under free). The Florida Aquarium is one of the most celebrated aquariums in the United States. Here you can immerse yourself in interactive programs like Dive with the Sharks, Shark Swim and Swim with the Fishes or take a Wild Dolphin Tour on board the Bay Spirit II (a 72-foot powered catamaran). And after exploring all the exhibits inside, make sure you visit the Aquarium’s new water play area The Splash Pad! Admissions: Adults are $24.95, seniors (60+) are $22.95, and children under 12 are $19.95 (Children 2 & under are Free). Admissions: Adults are $34.95, and children 3 to 11 $25.95. Manatees are a unique marine mammal local to Florida – but they are endangered. This viewing centre is a state and federally designated manatee sanctuary. During the centre’s open season, Nov. 1 through April 15, displays, interactive exhibits and more educate visitors of all ages about the life cycle of the manatee and the challenges this animal faces. Admissions: the centre is run by volunteers and is completely free. Have you been to Tampa Bay with your family? What attractions do you recommend they visit first? New York City is one of the world’s most notorious shopping destinations. So it’s no surprise that it knows how to celebrate Black Friday in style. Long before the annual shopping extravaganza hit UK shores, NYC was dishing out bargains – with famous department stores opening up early and 70% discount tags being the norm. If you’ve booked yourself an NYC shopping break that spans over Black Friday (or the days that follow – bargains can still be found weeks later) here is our quick guide to getting it right on the day. The department stores of New York City are world-famous and, as a result, everybody heads there first. Many of them open up early, so it really is a case of “you snooze, you lose”. Macy’s, Saks Fifth Avenue, Lord & Taylor, Barneys, Bloomingdales, JCPenny, and Century 21 will all have a line of people waiting to get in (make sure you’re one of them). On the topic of department stores – the iconic Macy’s has recently dropped the news that they will be open throughout the night. The doors will open at 5pm on Thursday, just hours after the annual Macy’s Thanksgiving Day Parade. Stores will stay open until 2am then close for a few hours. The doors will re-open at 6am on Black Friday. After you’ve grabbed some bargains from the big department stores, it’s time to escape Midtown Manhattan. This is the perfect excuse to head to Manhattan’s newest (and shiniest) shopper’s paradise: Brookfield Place. You’ll find even more high-end brands here, including Louis Vuitton, Lululemon, Saks Fifth Avenue, and J Crew. If you’re looking for some unique Christmas gifts, make your way to one of NYC’s Winter Villages. You’ll find them in some of Manhattan’s most famous public squares, though Bryant Park Winter Village is the most well-known one. There you’ll find jewellery, artisan soaps, home-made candles, art prints, and other unique gifts for your loved ones. Several brands and stores will offer exclusive offers on social media – including discount codes that you can show at the checkout. While the shops of NYC boast many incredible deals, the big savings only really apply to American brands. Many British brands sell goods in America at a higher price – so if you’re looking for some Burberry or Vivienne Westwood, you’ll make bigger savings in London. Sarasota boasts an interesting backstory. In the 15th Century, Spanish explorers expelled the Calusa people – leaving the place virtually empty until the Seminole Wars. While the place was once again populated – it was isolated until 1902 when the Tampa railroad was built. Sarasota then grew popular as a winter resort for the affluent, and the city’s arts institutions followed. Then circus magnate John Ringling decided to relocate his circus here, building a winter residence, art museum and college, and setting the town on course to become the artistic hub that it is today. This all led to Sarasota rising as one of Florida’s most diverse holiday destinations – which offers a lot more than just a pretty shoreline. It is also just south of Tampa, and is easy to reach from the UK. Here’s your guide to making the most of your time in Sarasota. If you’re looking to discover the local art scene, you can’t get much better than the official museum of Florida. Established in 1927 – in memory of Mable and John Ringling – it offers twenty-one galleries of European paintings as well as Cypriot antiquities and Asian, American, and contemporary art. The museum is in total home to more than 10,000 objects, but it’s most celebrated items in the museum are 16th–20th-century European paintings, including a world-renowned collection of Peter Paul Rubens paintings. The museum is open daily 10:00am – 5:00pm, Thursdays until 8:00pm, and can be found in north Sarasota towards Bradenton. The Sarasota Ballet has been around since 1987, but it was in 2007 that is became a big player on the world stage. This is when the renowned English ballet dancer and choreographer, Iain Webb, was appointed director and revolutionised The Company’s catalogue, introducing 146 ballets and divertissements through the 2017 – 2018 Season. Ballets by Sir Frederick Ashton are his personal favourite, but under his watchful eye The Sarasota Ballet has become recognised for orchestrating American premiers of international pieces, and commissioning new works (both from budding choreographers from within The Company and established choreographers from around the globe). 2019 performances include The Sarasota Ballet Gala, Transcending Movement, The Sarasota Ballet – Martha Graham Dance Company, and Giselle. You’ll find the Sarasota Ballet near Indian Beach / Sapphire Shores. Palm Avenue is known amongst locals for its collection of art galleries – and they are definitely worth visiting. If you’re in Sarasota on the First Friday of the month, stop by Palm Avenue between 6pm and 9pm for Palm Avenue’s First Friday Walks, when members of the Palm Avenue Arts Alliance sing, dance, and serenade the community and guests. Since 1973, scientists from Selby Gardens have ventured into some of the world’s wildest places to identify, study, collect and learn from exotic and remarkable plants – which has led to the gardens becoming a world-leader in the study and conservation of plants, particularly epiphytes. Some of the highlights at the gardens include Ann Goldstein Children’s Rainforest Garden, Tropical Conservatory, Towering Bamboo Garden, and the Koi Pond. Sarasota also boasts some incredible shopping opportunities. To start with, there are a few outlet malls within the area. The new Mall at University Town Center, located at Interstate 75 and University Parkway, is a shopping and dining destination, with more than 125 stores and restaurants. The Mall at UTC’s anchors are Macy’s, Saks Fifth Avenue and Dillard’s. Westfield Southgate in south Sarasota features retailers like Talbots and Chico’s, and even has a movie theatre. But if you’re looking for something independent and distinctive, Pineapple Avenue offers a row of antiques shops. While Main Street, also downtown, is home to boutique clothing stores and other fun shops. If you require any more convincing that Sarasota is the centre of Florida’s cultural scene – it is home to Florida’s oldest continuous orchestra. Opened in 1949, the 80-member Orchestra performs more than 100 classical, pops and family concerts each year. Upcoming shows in the 2018-2019 schedule include Legends, Perfect Pairs, Tis the Season, and La La Land in Concert. The golf courses in Sarasota are the perfect balance between being well-known enough that keen players will be impressed that you’ve teed-off there, but not so famous that they’re overrun. University Park Country Club is a members-club that also allows members of the public to play. All three nines (all are Ron Garl designs) are top notch, with speed and true rolls, and the course is noted for its great overall condition. And with all the different sets of tees you’ll feel like you are playing a different course every visit. Sarasota County is home to award-winning chefs and 21 Zagat-rated restaurants – so a trip round its local restaurants is definitely in order. If you’re in Sarasota with your other half, Euphemia Haye on Longboat Key is known as one of America’s Top 200 Most Romantic Restaurants. While Michael’s On East is Sarasota’s only AAA Four Diamond Restaurant. However, if it’s really important that you have a nice bottle of red with your dinner, The Crow’s Nest Restaurant & Tavern boasts 950 varieties of wine and has been awarded the Wine Spectator Award of Excellence and the “Best Of” Award of Excellence. While The Bijou Café claims the largest collection of South American wines in Florida. For something a bit more unusual – how about a trip to one of Sarasota’s two Amish restaurants? Both Der Dutchman and Yoder’s restaurants are the epitome of casual, home-cooked dining and are perfect family-friendly restaurants. The Amish pies have been recognized as some of the best in the country. There are also several food-based festivals throughout the year. Savor Sarasota Restaurant Week during the first two weeks of June offers a multi-course culinary experience at more than 60 restaurants. Let’s Eat, Englewood in the fall also celebrates dining, with multiple restaurants offering special menus. Forks & Corks Food and Wine Festival, a multi-day event by the Sarasota-Manatee Originals, includes food and wine seminars at various restaurants. The Whiskey Obsession Festival showcases more than 200 spirits to taste, ranging from the elegant to the sublime. Finally, the Suncoast BBQ & Bluegrass Bash in Venice brings award-winning pitmasters to Venice. Finish your holiday by letting your hair down in the centre of Sarasota nightlife scene, where you’ll find craft beer, cocktails, light bites and unique characters. Some of the most popular places include Jack Dusty at The Ritz Carlton, Selva Grill, Social Eatery & Bar, and State Street Eating House + Cocktails. Have you ever been to Sarasota? Leave us a comment letting first-time visitors know what should be first on their list. Loved-up couples looking for a destination wedding that is fun and original shouldn’t look any further than Las Vegas. Weddings are a big deal in Las Vegas, with more than 115,000 of them taking place every year. It’s not just 3am Little White Chapel weddings either. Most of the major hotels have chapels and you can even get married outside the city with the striking Nevada landscape as your backdrop. Plus, planning a Vegas wedding is simple: you can literally arrive, obtain a marriage license, and be married before sunset! There are hundreds of venues to say “I do” across Las Vegas. It’s also possible to marry in Las Vegas on the cheap with several chapels offering dress and tuxedo hire. Though a big wedding with professional photography, beauty treatments, and a large reception dinner can also be easily organised. Here are just four of the most iconic wedding venues and locations available. Do we need to introduce the Graceland Wedding Chapel? It has been a prominent part of the Las Vegas Strip for 50 years and stays true to its 1950s routes with the option of hiring an Elvis impersonator! While this has gained a reputation over the years for “drive-in weddings” – many loved-up couples have held daytime ceremonies here with all the trimmings. Their complete package includes wedding coordinators, photographers, a flower shop, and tuxedoes for hire (plus an Elvis impersonator!). Imagine getting married surrounded by one of the world’s greatest natural wonders. You’ll be whisked away by a helicopter where you’ll enjoy magnificent views of the Grand Canyon, before landing on the canyon floor to exchange your vows. You can also organise for a limo to take you between your hotel and helicopter base. If you fancy getting married with the striking Nevada landscape as your backdrop, but aren’t sure about a helicopter tour of the Grand Canyon – we recommend Red Rock State Park (the ground is flat and you’ll be driven there by limousine). We recommend booking it morning or late afternoon when the landscape is at its most dazzling. Getting married in Las Vegas is a straightforward process and is legally recognised in the UK. You’ll firstly need to bring the following documentation with you to Las Vegas (and to your wedding). To obtain a marriage license in Las Vegas both individuals need to visit the Clark County Marriage Bureau along with all the documents mentioned above and $77. The marriage license is issued immediately and is valid for 1 year. You can save time by filling in a pre-application form online, but you will still need to stop by in person (the office is open 24/7). It’s rare that a taxi driver won’t know where the Clark County Marriage Bureau office is, but here’s the address for safe keeping. And voila – you are legally married! Have you got any more questions about getting married in Las Vegas? Leave them in the comments below. I have just returned from a wonderful trip to Las Vegas and was lucky enough to take in one of the famous Cirque du Soleil® performances. When you are in Vegas, there are some experiences that just cannot be missed, and this is definitely one of them. I can say with confidence that a Cirque du Soleil show in Vegas is an absolute must do, and I would recommend taking in a show to anyone planning their trip. With such a variety of shows on offer it can be difficult to make a decision. Each show is unique and there really is something for everyone. I opted to see Mystère™ by Cirque du Soleil® at Treasure Island. 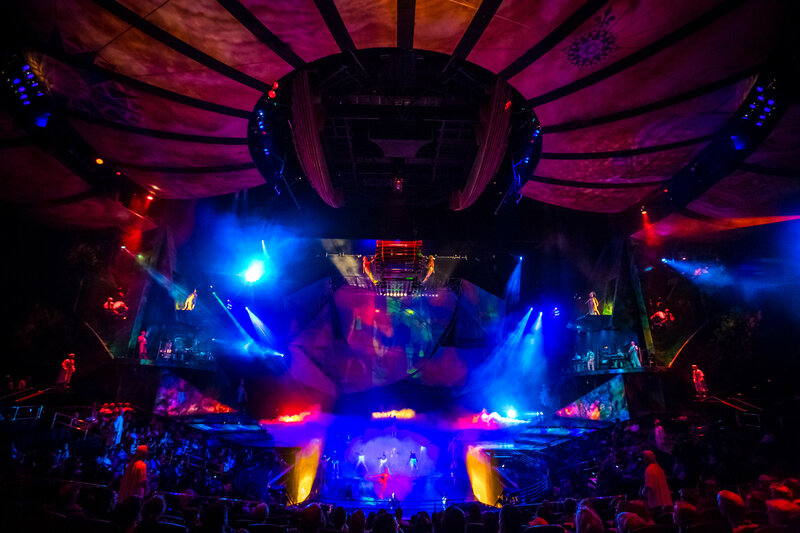 Mystere by Cirque du Soleil is the original Cirque du Soleil production. Combining high energy acrobatics and dramatic dance, the show caters for all ages and is suitable for families. Some of the acrobatic stunts were so intense that I was literally on the edge of my seat! 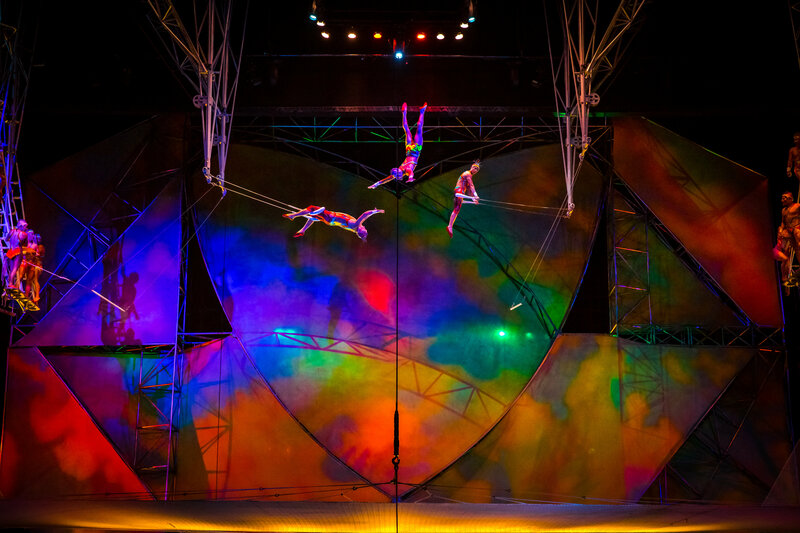 The artists put on an exciting, thrilling show, with comedic acts to entertain the audience. There is also some audience participation which is great. The performance takes places to the thunderous rhythms of the Taiko drums, an amazing experience in itself. I highly recommend purchasing your tickets in advance, so many people are left disappointed when they arrive in Las Vegas only to find out the show is sold out. The shows are incredibly popular and certain performances sell out weeks in advance. I highly recommend pre-booking your tickets to guarantee you get the best seats and avoid any frustration. Don’t worry if the show is close to capacity, the theatre is designed incredibly well, with seats raised all around the stage. With artists on the ground, trapezing through the air and running through the audience, you will always have sight of something.